2014 Ultimate Blog Party | A Savings WOW! 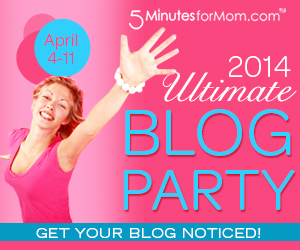 It’s the 2014 Ultimate Blog Party and we’re joining in on the fun! It’s a great way to get to know more about us and also to find out about some other amazing blogs! We’re a happily married couple with four kids, busy lives, and ever-growing expenses, so we try to save money on the purchases we make and the things that we do in our everyday lives. We started A Savings WOW! to share our experiences, savings tips, and most importantly, our passion for helping others save money, too! We started couponing consistently and living more budget-friendly when we had our third child and went from a two-income to a primarily one-income family. With our costs continuing to rise, we wanted to be able to enjoy our lives without breaking the bank. We practice what we share here on our site, using the tips and techniques to be smarter shoppers. More recently, Jim had a stroke and has been going through therapy to regain function on the side that was affected. While he has been on leave from work, we’ve especially used our couponing skills to make sure we are using our money wisely. A Savings WOW! is dedicated to helping you enjoy your life without breaking the bank by providing money-saving resources such as classes, coupons, deals, freebies, giveaways, and reviews. After you use the tools we give you, people will say to you “What a savings! WOW!” after you tell them how much you paid versus how much it should have been. Besides sharing these resources online, Maria also teaches workshops and speaks to groups in the Chicago-area. Join her on Monday, April 7th from 12:30 PM to 2:30 PM for a free Grocery Savings Workshop as part of Money Smart Week 2014. Register here to reserve your spot! Maria has also been featured on various news shows sharing money-saving tips. Some of the networks she’s been featured on include: FOX, NBC, CBS, and WGN. Let us know how we can help you put money back in your pocket. Tell us what topics you would like to see us share by leaving a comment below. Don’t forget to follow us on Facebook, Twitter, Google+, YouTube, Pinterest, and Instagram for our latest updates! Good morning! Stopping by from #UBP14. I love saving money and using coupons too. Prayers to Jim that he gets better quick from the stroke.